The sun emerging from behind a cloud on a foggy but sun-bright day. I went out for the morning to find a coffee shop to read here in Halifax, but many were closed since it is Canada Day--a day similar but also quite different than Independence Day. After a few hopeful options went dry, I came down to the boardwalk to see if there was anything, but there wasn't. However, there was this glorious contrast of fog with the sun. It was such a fascinating view--it felt almost as if the sun was bearing down on the water and turning it into vapor before my very eyes. 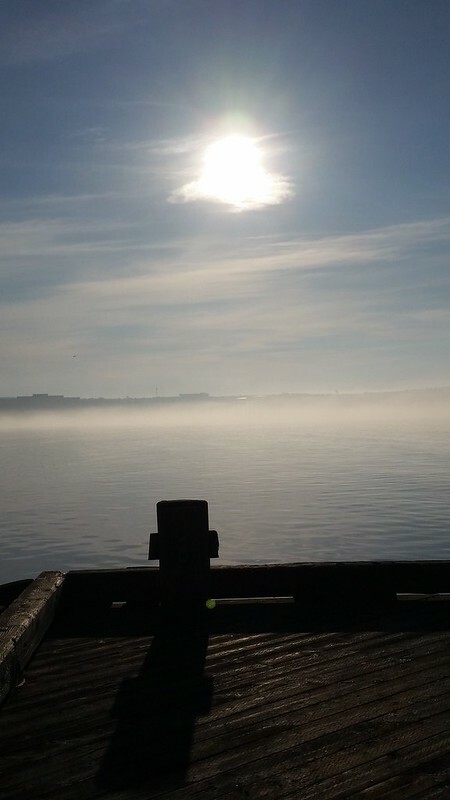 I snapped a few different photos, but I liked this one because it capture not only the sun and the mist, but also the long shadow of the pier as well as the land (which is Dartmouth, I'm told) in the background. This image typifies our experience thus far in Halifiax, a mixture of sun and water--sometimes, at the same time!